We’ve learned about the basics of ICU liberation as well as some evidence-based strategies for managing sedation. Now, let’s talk about mobility. Atelectasis and poor pulmonary toilet: Lungs are aerated best when they are upright and expanded by physical movement. On the other hand, it’s difficult to cough and clear secretions while bedbound. Pulmonary and peripheral edema: Lying supine increases venous return to the heart, worsening pulmonary congestion. At the same time, immobility means that the muscle pumps aren’t draining the venous and lymphatic systems, resulting in peripheral pooling of fluid. Impaired bowel and bladder function: Digestion is stimulated by movement, and many patients find voiding difficult while supine. Constipation, ileus, and urinary retention are common without the ability to mobilize. Pressure ulcers: Decubitus wounds can develop even with diligent nursing care in immobile patients. Physical deconditioning: Muscular atrophy begins to occur within days without load-bearing and muscle lengthening, and the resulting weakness can last for months if not years. Venous thromboembolism: DVTs are a frequent consequence of immobility even with mechanical and pharmacologic prophylaxis. In reality, though, the mechanistic harms of immobility are only important to a degree. What matters is the outcomes. Let’s have a look at that data. Multicenter RCT of 200 patients in European and American SICUs. Mechanically ventilated patients (26% trauma) randomized to receive early goal-directed mobilization, or usual care. No additional therapists needed, but a “facilitator” (existing staff) contributed about 15 minutes per patient per day. Mobility was nurse-driven. Upon admission, patients entered a scaled mobility protocol, with inclusion/criteria for entering each step. Patients qualifying for each level would be automatically mobilized by the bedside nurse without needing assistance from skilled PT or OT. In Mundy 2003, mobilizing non-ventilated patients with community-acquired pneumonia decreased hospital length of stay by 1 day. Most of the projects that featured skilled therapies combined physical and occupational therapy, but at least one focused directly on OT for ICU patients. In Alvarez 2017, intensive OT for non-vented elderly ICU patients reduced delirium (20% to 3%), improved mental status, and yielded better independence and more strength at discharge. Does mobility need to be intensive or just early? Wright 2018: RCT of 308 medical/surgical ICU patients. Randomized to receive intensive PT versus usual care. However, actual difference ended up only being 13 vs 23 minutes, and therapy was not early (median 7 days from admission to first session). No differences between groups. Lessons: more aggressive but delayed mobility may not be beneficial. Therapy probably needs to start within the first few days from admission. Neuroscience patients, such as neurotrauma, intracranial bleeds, spinal injuries, and so forth might seem to be poor candidates for early mobility. In many cases their movement may be limited by neurologic deficits or the need for spinal immobilization. However, while the benefit in these patients may be blunted, the signal still seems to be present. Hester 2017: Before-and-after data with a nurse-driven mobility program in a single neuroscience unit. Results: shorter length of stay; fewer VAPs, CAUTIs, and HAIs; fewer 30-day readmissions; and an estimated 3-year cost savings of $3 million dollars. The effect was independent of sedation practices or diagnosis. No increase in falls, accidental extubations, or other safety events. Titsworth 2012: Before-and-after data of a nurse-driven mobility program in a single neuroscience unit. Results: shorter length of stay, fewer hospital-acquired infections, and a reduction in Foley use. No difference in adverse events, falls, or vent days. AVERT 2015: Multicenter RCT of 2104 stroke patients, both ischemic and hemorrhagic. (Not an ICU trial.) Compared “very early” PT (<24 hours from symptom onset) to usual care. Difference was about 6 vs 3 sessions per day, 31 vs 10 total minutes of therapy, and first mobility was 18.5 vs 22.4 hours from symptom onset. Neuro outcomes were actually worse in the intervention group. Bernhardt 2016: Prespecified dose-response analysis of AVERT trial. On subgroup and multivariate analyses, with other things being equal, patients mobilized earlier did have better neuro outcomes and patients mobilized more frequently may have had less mortality, but patients mobilized for longer (total time per day) did worse. Inflection point was around 13.5 minutes per day. Lessons: Neuro patients still benefit from early mobility, although the effect may be somewhat attenuated compared to other populations. For the specific group of stroke patients, very early mobility (within the first day) may be inappropriate (perhaps worsening ischemic penumbra) — or perhaps early, frequent, short sessions may be desirable. Messer 2015: Staff education alone on the importance of early mobilization increased the number of patients sitting edge-of-bed and dangling, but not getting out of bed. Hunter 2017: An educational campaign to train nursing on a process of early mobilization had little sustained effect on mobility in the long run. Hassan 2017: A nursing education program alone led to no change in mobility for vented patients. However, after initiation of a reward-based incentive program and a persistent campaign to introduce mobility into unit culture, mobilization increased 2–3 times. Lessons: education alone is not sufficient to create mobility. Knowledge gaps among staff are easily closed, but motivational incentives are needed to actually change routine practice. Yes. Essentially every one of the above studies reported minimal complications. Loss of airways, vascular access, etc were extremely rare and almost never clinically significant; the most common complication was simply aberrations in vital signs (e.g. tachycardia) requiring therapy to be paused or stopped for the day. Individual centers have even reported ambulating patients with femoral ECMO cannulae in place, balloon pumps, and practically any other hardware imaginable. 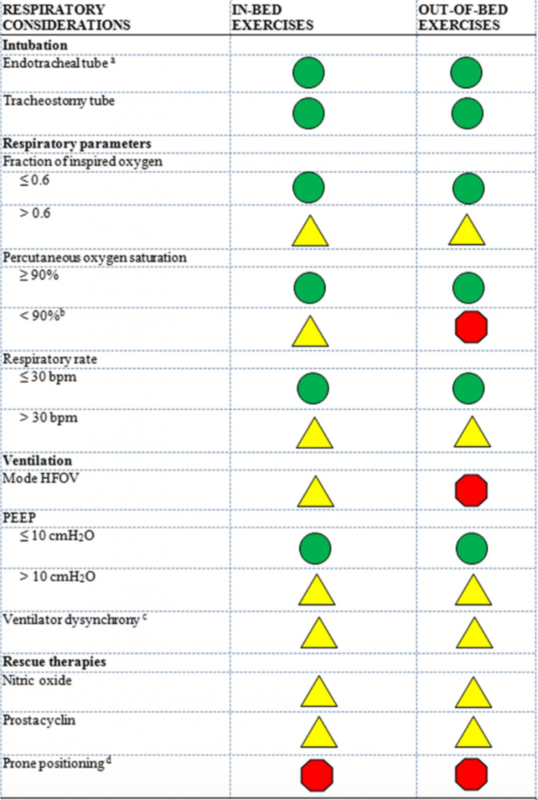 Finally, Hodgson 2014 performed a formal, multidisciplinary expert consensus process to determine specific criteria for safe mobilization of ventilated patients. Some of the projects above had zero added cost, utilizing only existing staff and equipment. Others hired additional PT/OT staff or a dedicated mobility team and purchased additional equipment. In all of the projects that reported cost metrics, however, true or estimated savings were greater than the added expenses. Lord 2013 specifically looked at this, using the results of the Needham 2010 project (above). They created a series of models for cost savings based purely on changes in direct-variable ICU costs from reduced length of stay. Although the results vary according to best- to worst-case scenarios, the expenses undertaken, and unit size, they projected a net savings of $817,836 in the Needham project, in 83% all possible scenarios, and a maximum savings of $3,763,000 in their best case model. Early mobilization of ICU patients is feasible and safe. There is a consistent signal, albeit of variable strength, that it reduces the ICU and hospital stay as well as duration of mechanical ventilation. It must be done early (within the first few days after admission). Most ICU patients are candidates for some degree of mobilization, including intubated patients. It need not, and perhaps should not be intensive, merely early; other details on the optimal “dose” of therapy are not yet known. In many centers it need not involve any additional outlay of resources, although if it does, they are usually recouped by the resulting savings. Come back next time, where we discuss importance of diagnosing and preventing ICU delirium.